Camille O'Sullivan, as Marie, and Patrick O'Kane, as Woyzeck, in the GIAF/Landmark production of Woyzeck In Winter. CAMILLE O’SULLIVAN loves that line in Leonard Cohen’s ‘Anthem’ - “There’s a crack in everything, that’s how the light gets in”, that even in the darkest recesses of life and art, some hope will be found, light will always break through, to, if not banish the dark, then at least to light the path through it. Woyzeck In Winter, a major new production fusing two separate works - Georg Büchner’s 1836 play Woyzeck, and Schubert's 24 song cycle, Die Winterreise, written in 1823/4 - will receive its world premiere at the 2017 Galway International Arts Festival. While the works are unrelated they make natural bedfellows; both dealing with doomed romance, heartbreak, mental illness, and lives ruined and destroyed. Woyzeck is a poor soldier who earns extra money for his family through menial jobs and participation in bizarre medical experiments. Brutalised by society and consumed with jealousy, he descends into despair, and finally, a desperate, violent, act. Die Winterreise dramatises a heartbroken obsessive, staggering miserably through the winter wastes towards his own destruction. 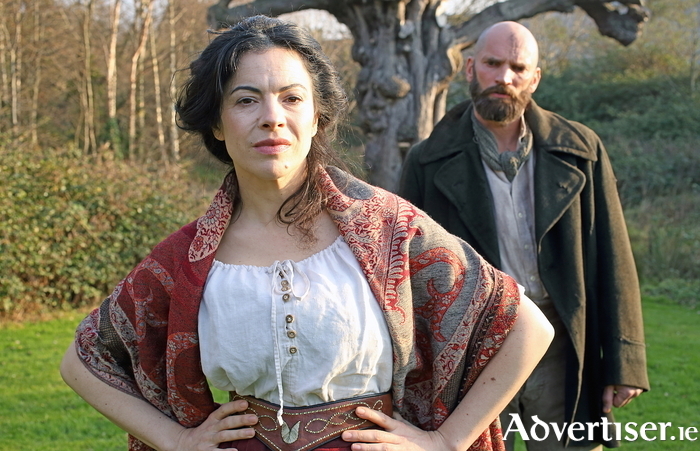 Clearly this is a work which looks deep into the darkest depths of humanity’s dark side, but for singer Camille O’Sullivan, who plays Marie, the wife of Woyzeck, that is what makes it so attractive. The play has been adapted and directed by Conall Morrison - Camille calls it Morrison’s “10-year brilliant thought in the making” - with musical direction by Conor Linehan. It boasts an all-star cast with Patrick O’Kane (Woyzeck ), Barry McGovern, Susannah De Wrixon, Rory Nolan (who Galway audiences will know from numerous Druid productions ), Rosaleen Linehan, Camille, and others. Since the noughties, Corkonian Camille - born to an Irish father and French mother - has won acclaim as a superb vocalist and interpreter of the work of Nick Cave, Jacques Brel, Tom Waits, and Leonard Cohen. She has played toured solo, performed at music festivals; and starred in musical theatre. Anyone who has heard her sing, or has seen her shows, knows the lure of the darkness fuels her art. On-stage Camille exudes confidence, sexiness, and swagger, but she admits in reality, she is often quite shy, and can be very nervous ahead of stepping on stage. “It’s hilarious,” she admits. “None of my friends recognise me when I’m on stage, but it took me many years to get the confidence to go up and sing. It is that ‘fight or flight’ thing. Once you’re in front of the audience, it’s like a fuse is lit, it matters. You have to imagine you are a bigger animal than the audience, you’re a tiger. All of this - the light, the dark, the hidden, the revealed, the inner person, the person on display, all feeds into the Marie character, making Camille the ideal person to portray her. “Marie is Woyzeck’s wife and the mother of his child,” says Camille. “It’s Woyzeck’s love of Marie that drives him into madness. In Marie’s journey, I look for what’s the woman’s issue. Marie can’t be just the object of her husband. When she gives out about someone, says something about them after they leave the room, she reveals her own torments, and doubts about herself. She is not just a person who has done something bad, you hope people will have empathy of her, despite the things she has done. If Marie has dark depths, Woyzeck is truly plunged into a nightmare by the medical experimentation he volunteers for. “For Woyzeck it’s about the dehumanising nature of how he is treated by the doctors, and how the system can break a person,” says Camille. In many ways, Woyzeck In Winter, through song and text deals with mental illness - the piano as a metaphor for the mind; beautiful when in tune but very easy for it to become detuned or unstring. As such, despite its 19th century setting, it touches on a contemporary issue, and comes at a time of greater public openness about mental health. Camille’s work ranges from rock to chanson to musical theatre, but Woyzeck In Winter is a new challenge altogether, as she - and the cast - will be singing works composed for classical/operatic voices. Woyzeck in Winter, a co-production between GIAF and Landmark Productions, runs at at the Black Box Theatre from Monday July 17 to Sunday 23 (previews from July 12 to 16. For tickets see www.giaf.ie and the Festival box Office, Forster Street.